Yesterday was the first day of school for my kiddos, so I finally have some time and some internet bandwidth to get a blog post up. I definitely took a Summer Break from the blog this year. 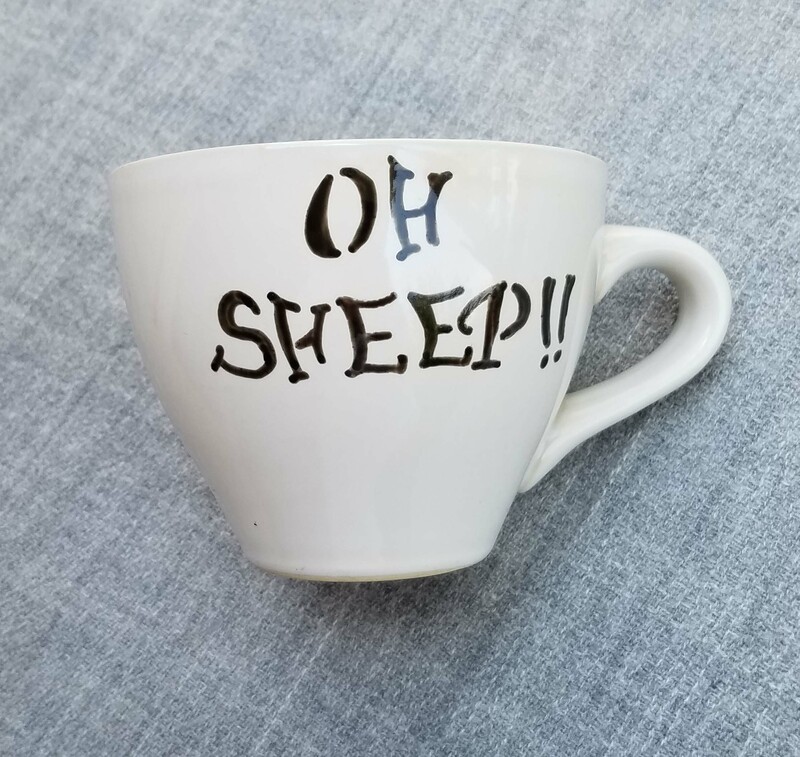 Lots of exciting things going on in my Crochet world and my Sheep world but I’ll be jumping around a bit with my posts the next couple of months. 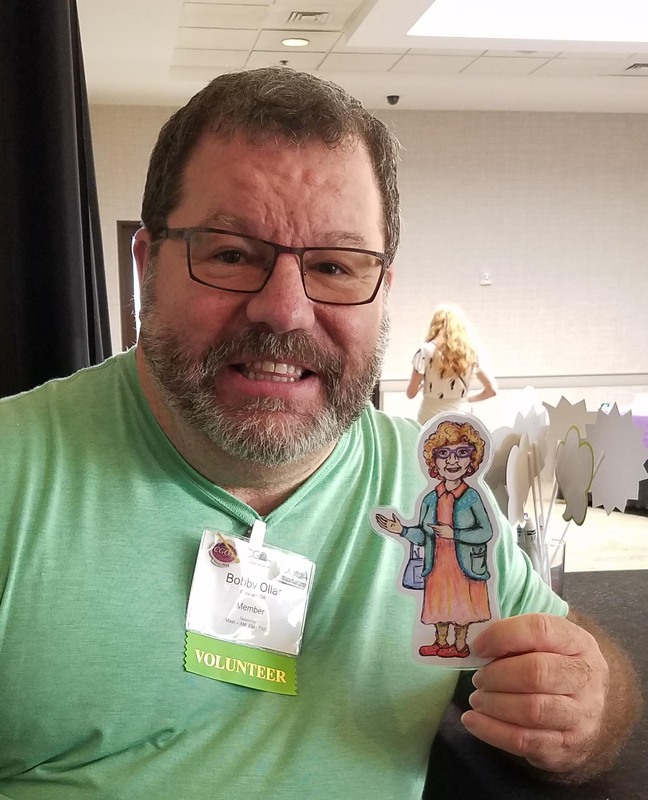 Being that I am now on the CGOA Board of Directors a lot of June and early July work time was dedicated to helping get things organized for the ChainLink conference that was held in Portland, Oregon July 25-28. I flew out to Portland on Tuesday July 24 and didn’t come home until July 31. 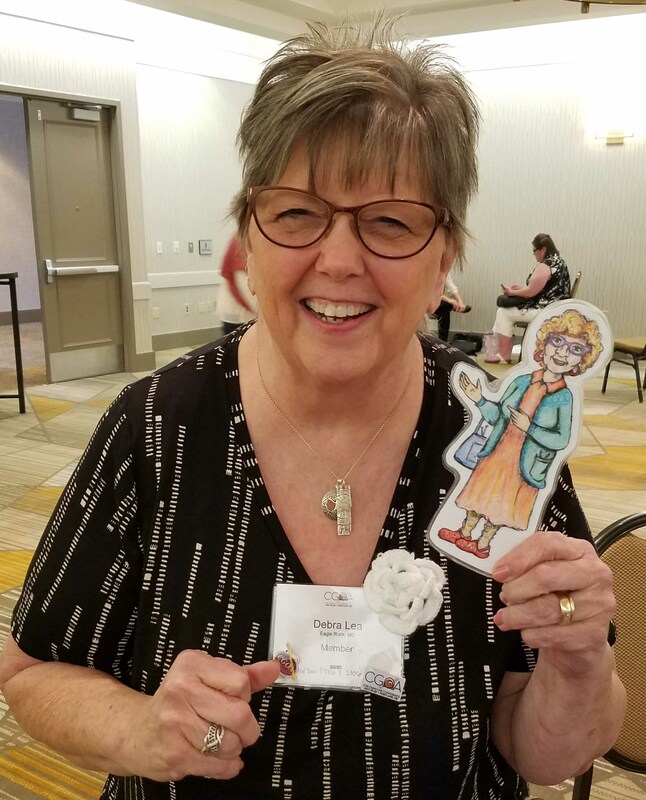 The extra days were because I also attended the Craft Yarn Council’s Certified Instructors Program, more about that in a later post. Unfortunately the first morning back home I woke up with a nasty cold bug that has laid me low for nearly 2 weeks. Don’t these germs know I don’t have time for them?! I’ve been slowly playing catch-up with a couple of days this past week that I was on the go all day. Let me tell you all about ChainLink though. As always it was a fun and educational time. I was seeing it from a slightly different angle this time with being on the Board. Maybe the strangest moment for me was when I got to the Business Meeting Thursday night and had to sit on the stage looking out at all the meeting attendees. 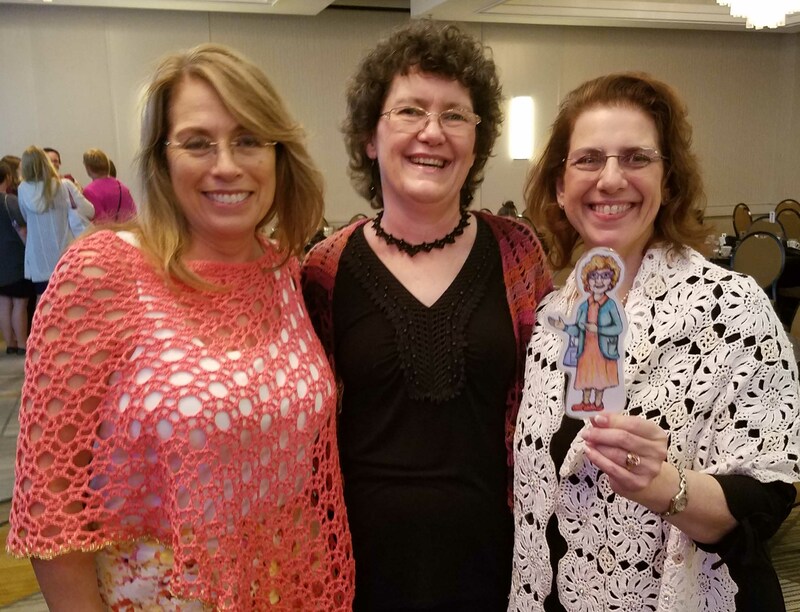 Though looking out at everyone made me realize how many crochet friends I have made over the years of attending conferences. 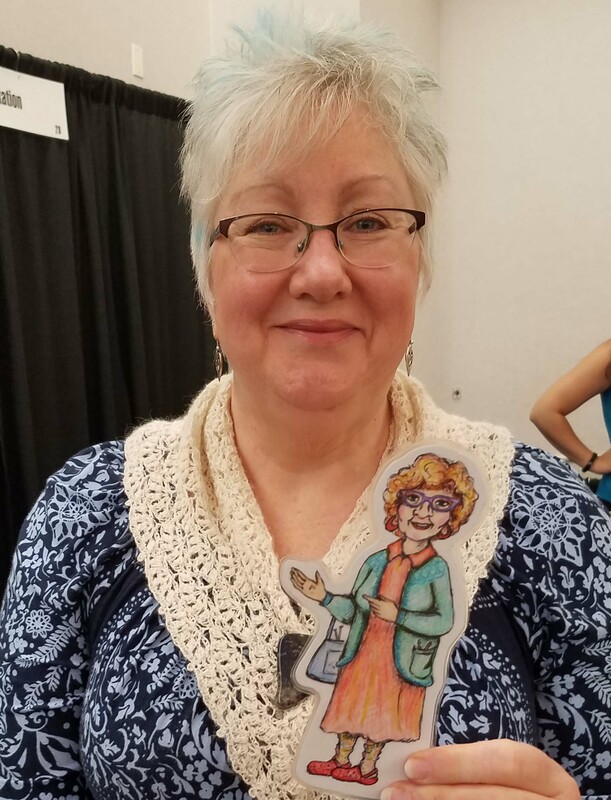 This is my friend Sharon who I met at my 2nd Knit & Crochet show that was in Portland in May 2009. 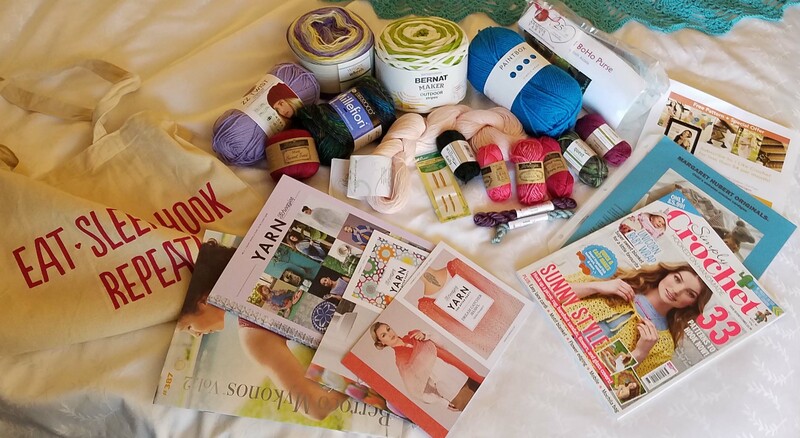 One of the fun things about this trip was that my journey with CGOA all started with the Portland Knit & Crochet Show in September 2008. When I found out about that show I also discovered CGOA and joined that July when I registered for the show and classes. That meant that this year’s conference was also my 10 year anniversary of being a CGOA member. This made for a full circle feeling too, with my first ever conference being in Portland and my first conference as a board member being in Portland as well. I’m a goofy geek, things like this make me smile. Tuesday evening was all about getting settled into Jan and I’s room and re-uniting with lots of friends. The next day I was going to be very involved with Professional Development Day so didn’t have too late an evening. I was one of the first to arrive at the room for PDD, and helped with set-up. 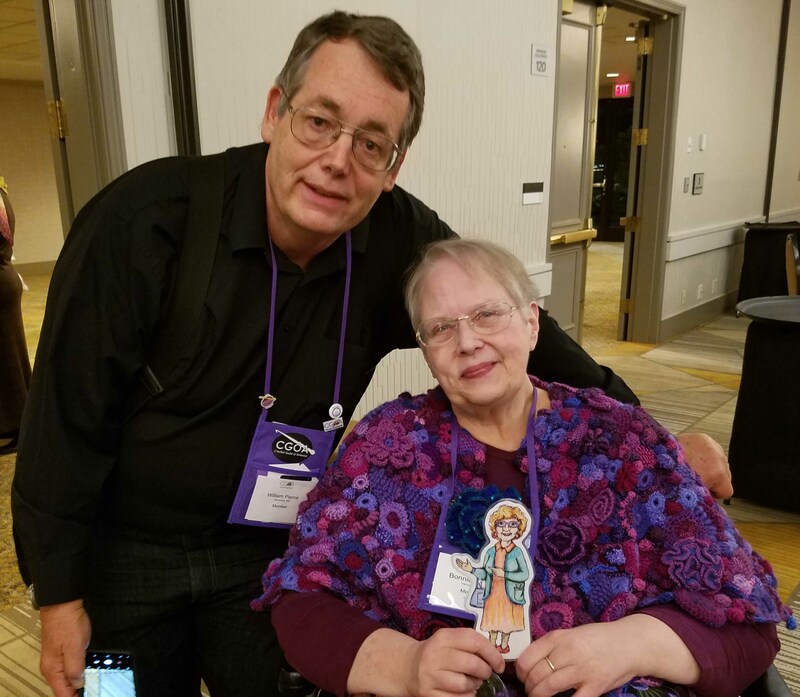 One of the first people I got to meet was Debra L who knew me because of Florence and her adventures on Instagram. So of course, we needed a photo with Florence and Debra before the day was done. I’ll get into more detail about Florence in a future post, you’ll be seeing her a lot in photos from this conference though. I enjoyed attending the presentations of colleagues and especially found Tamara Kelly’s presentation about email Newsletters interesting. Lots of food for thought. That afternoon I did 2 short break-out presentations on “Face to Face; Facing your Fears”. I was happy that so many attendees found my subject helpful. Once the afternoon presentations were over there was the final presentation by Salena Maestas on goal setting that was really inspiring. 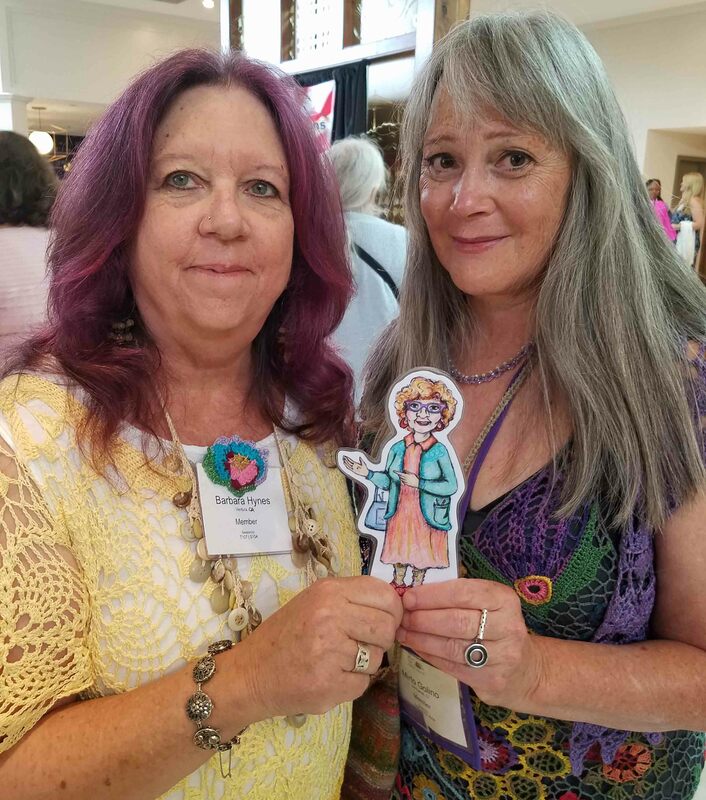 Whether you are already a crochet professional or are looking at becoming one, the Professional Development Day at the conference is a really useful event to attend. 2019’s conference will be in Manchester, New Hampshire July 10 – 13, with Professional Development Day on July 10. After PDD I checked in with my other committee chairs for the Design Competition and Fashion Show to see how things were going. Judging was wrapping up for the Design Competition and Fashion Show entries were looking a little sparse. Since the deadline for turning in Fashion Show garments wasn’t until the next day at 4 p.m. I hoped we were going to be seeing more turned in. In between all the running around I picked up my conference merchandise. This is the gorgeous commemorative hook from Furls. Wednesday evening was the start of classes at the conference and lots of folks were arriving that afternoon in preparation for taking classes. 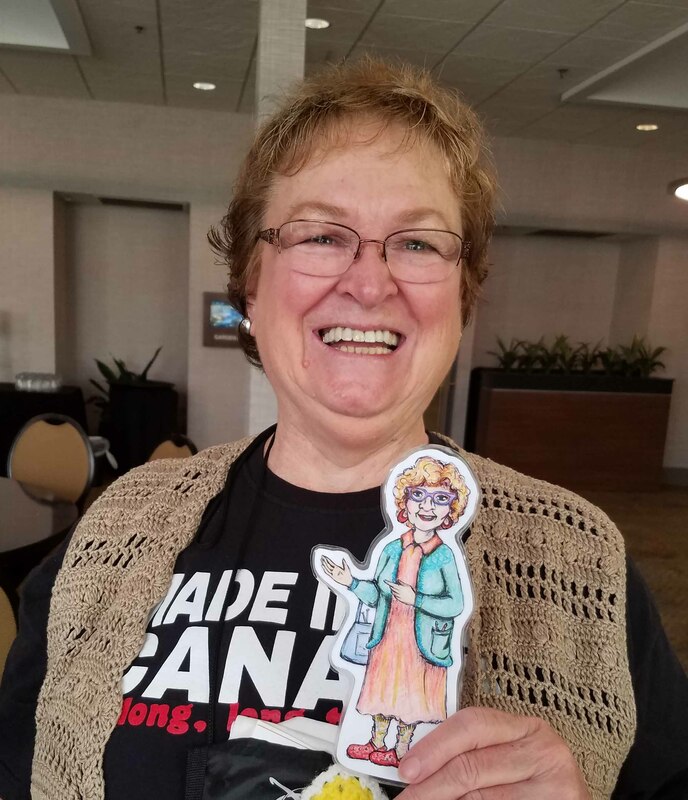 My roommate, and long-time conference attendee, Jan loves taking classes. She always takes classes in each slot that is available. Because I had already blown my budget for classes this trip with the CIP class I didn’t get to sign up for any of the CGOA classes this time. So I got to live vicariously thru friends that were taking classes. I spent my evening visiting with friends and took a dip in the hotel pool and hot tub. Thursday seemed to go by in a blur. The morning started with the Volunteers’ meeting, which I missed. I’m not really a morning person and this was the one morning I had marked to sleep in. The Volunteers that attended the meeting were all given a Thank You bag with useful information and some goodies. 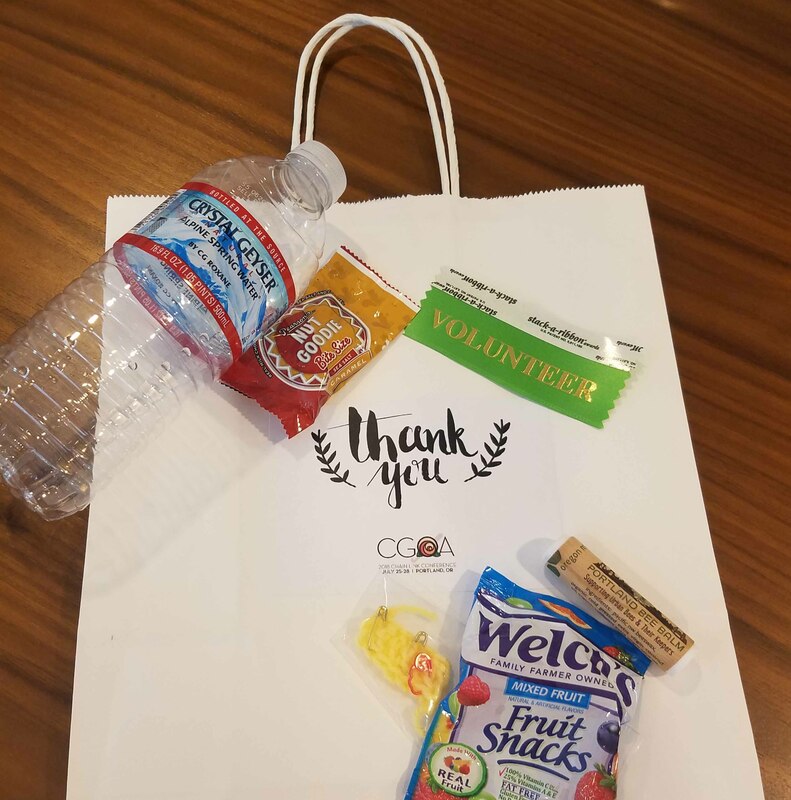 If you are interested in volunteering with CGOA you aren’t limited to helping at the conference, though we really appreciate our conference volunteers. There are lots of opportunities to volunteer with CGOA to help with the various committees that keep our Guild running and growing. That evening was the Business Meeting and the Market Preview. It was a good size crowd at both events. Our president, Linda Dean, handled most of the speaking duties at the podium with input from the rest of the Board. There was a bit of hilarity with the microphone since Linda is taller than most of us. You can see a video of the meeting on the CGOA page on Facebook still. After the Business meeting it was time for the Market Preview. I missed the crowd for the actual moment of opening due to delays with leaving the business meeting. Everyone was very excited though. The shopping bags we were handed as we came into the marketplace were fabulous. 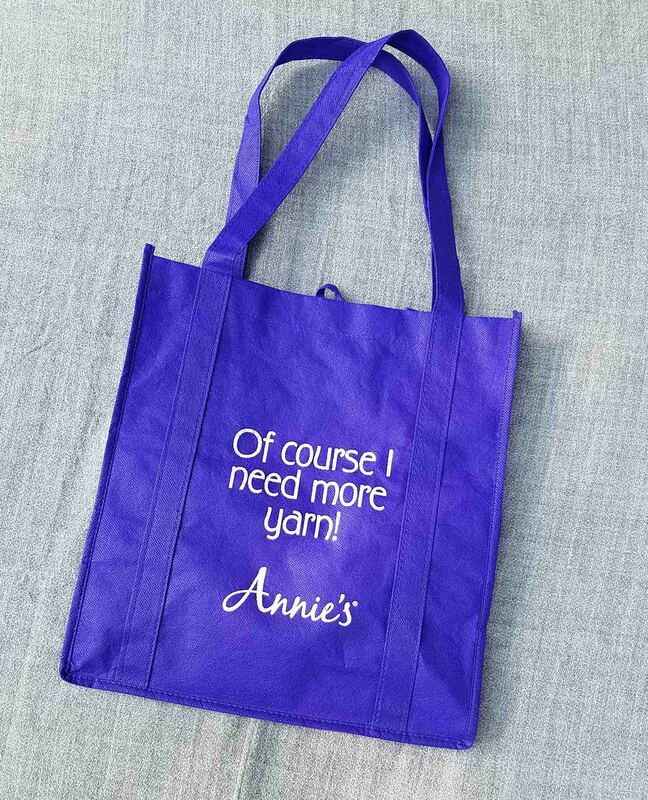 Sponsored by Annie’s they were printed with “Of course I need more Yarn”, it’s bad when even your shopping bag is enabling you. Despite being late to the opening I manage to do a little retail therapy that evening. 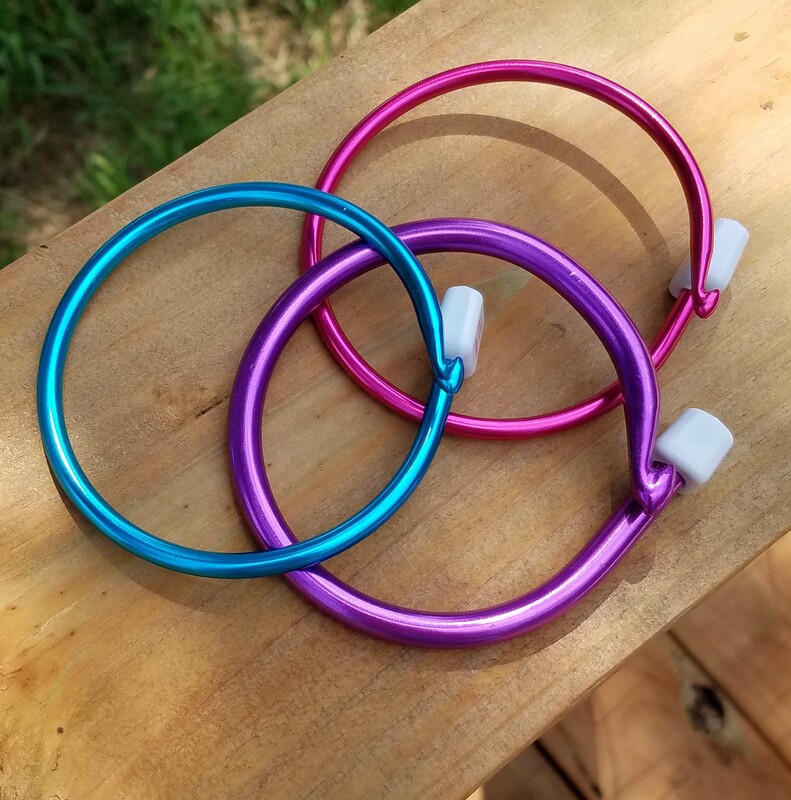 These lovely bangle bracelets caught my eye right away. They are made from Tunisian crochet hooks that are “seconds” from the manufacturers. Then the folks at “Renegade Yarns” bend them into circles to create the bangles. I actually bought 4 of them, the 3 you see above and a green one as a gift for Jan. I also couldn’t resist this yarn at Newton’s Yarn Company. They had a table full of bags of Sale yarn. I loved this bright aqua color and thought the gold and bronze color would be a lovely accent color. Not sure what this yarn will grow up to be once I start working with it. 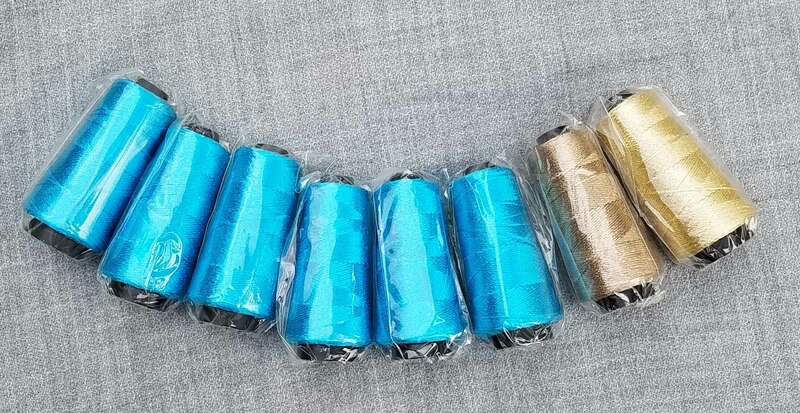 Very likely some sort of wrap. 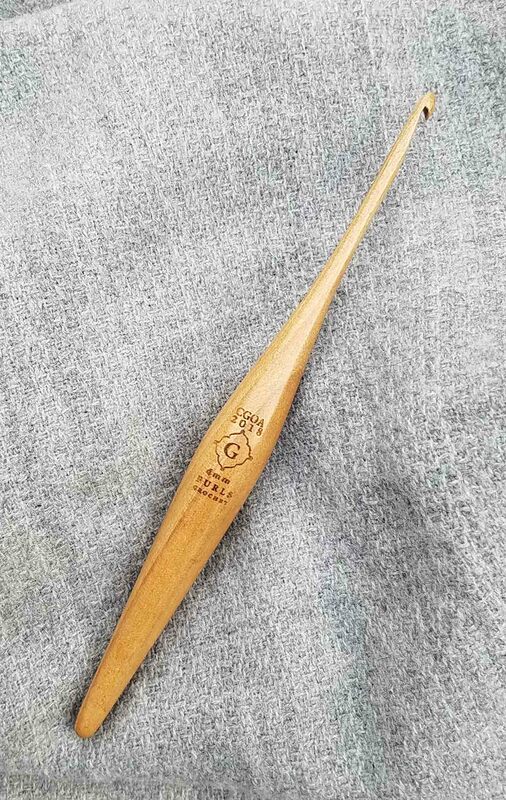 When Jan and I were comparing purchases later that evening she showed me a really neat shawl pin she had found. 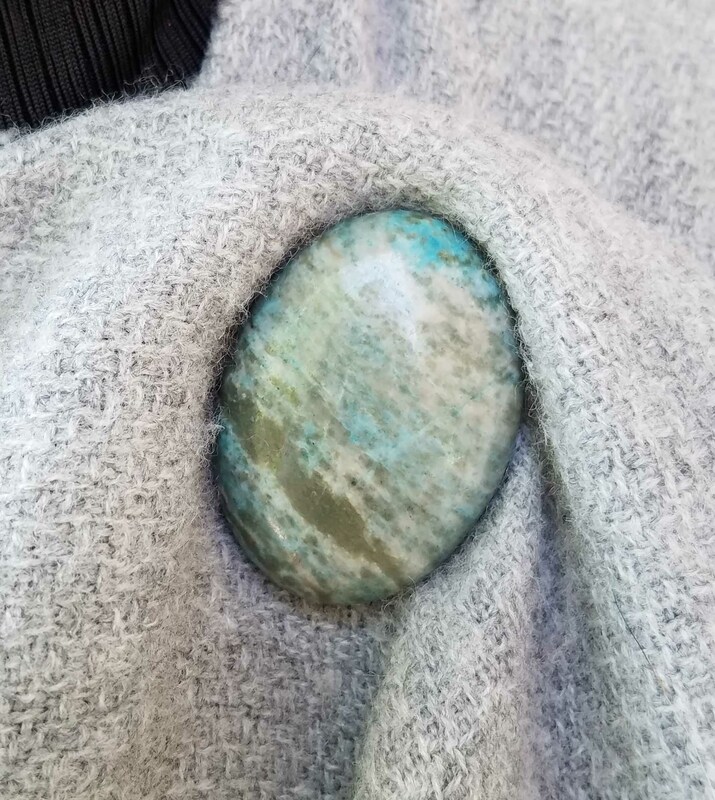 It was a beautiful semi-precious stone with a magnetic closure on the back. I decided I needed some of those too. I especially liked how you could wear the magnet backing under your garment so your wrap would really stay put. Friday I spent some time checking in with my committee chairs and then went to the marketplace to look for the shawl pins. 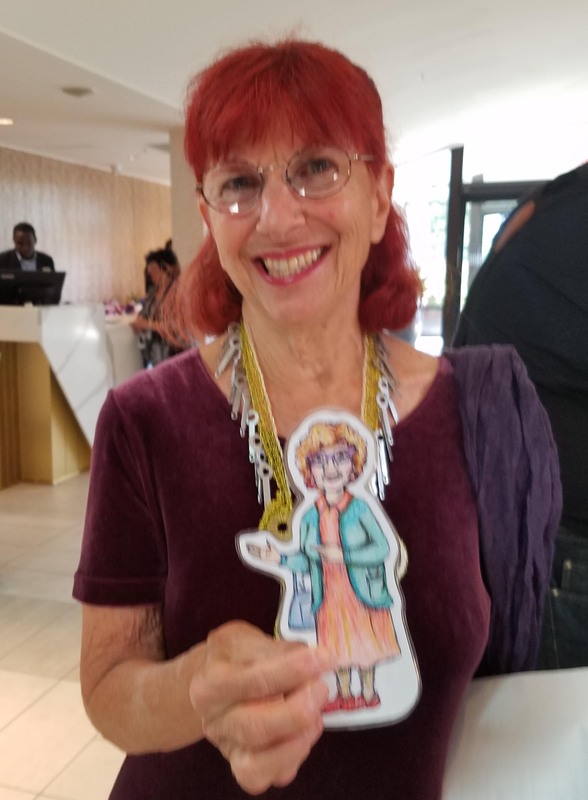 This is Michele of Rock N’ More Accents that makes and sells the beautiful pins, you can find her on Facebook as “Spinning Mind Designs”. I ended up purchasing 3 different ones because I couldn’t make up my mind. 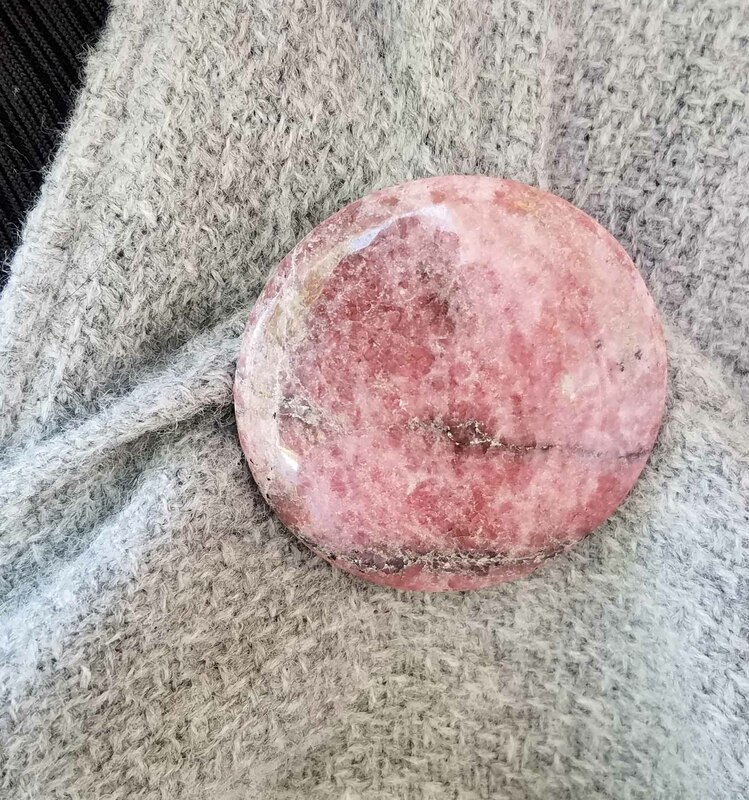 This pretty pink and gray toned Rhodonite one. This dyed Jasper one in Teals and Blues. And a gorgeous South African Picture Jasper one. 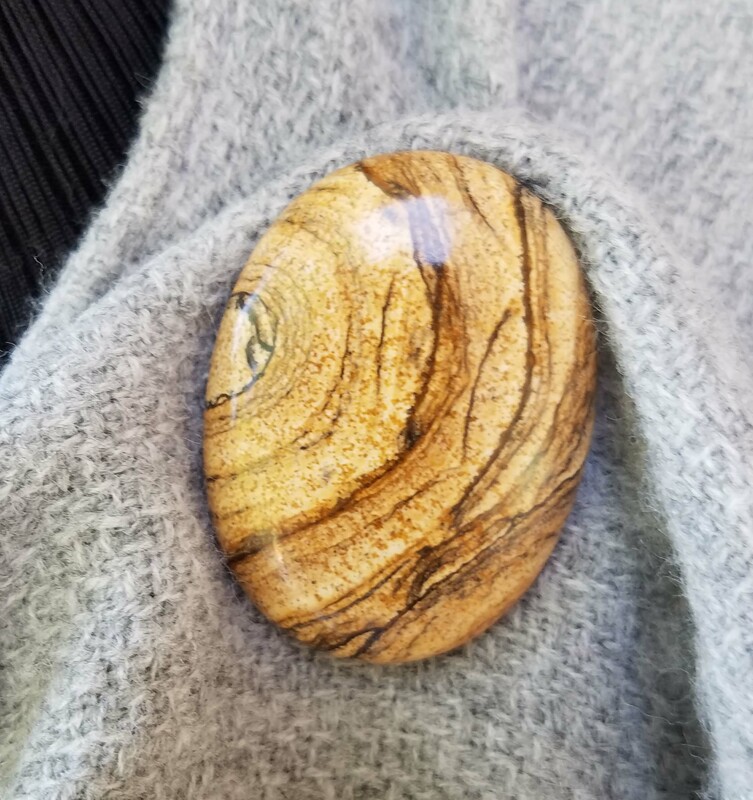 I liked this one because it has the look of wood and I thought could be a good neutral pin to wear with lots of my wraps. 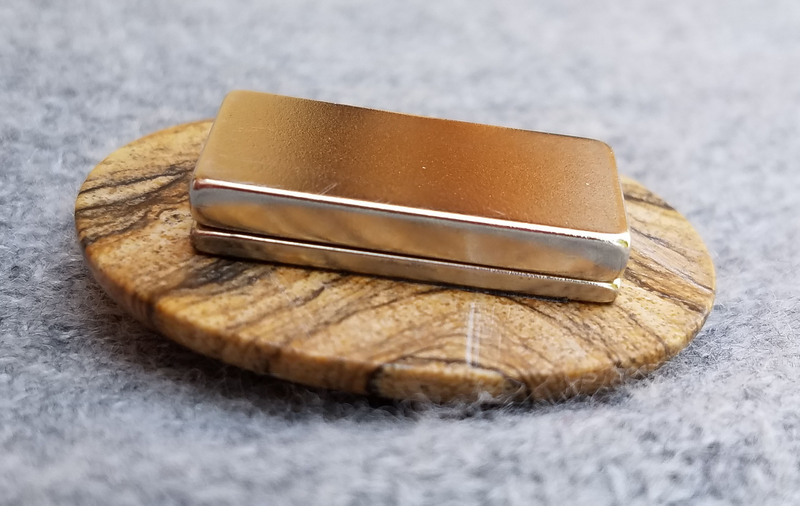 The magnet is so strong you have to slide them off to open the pin. 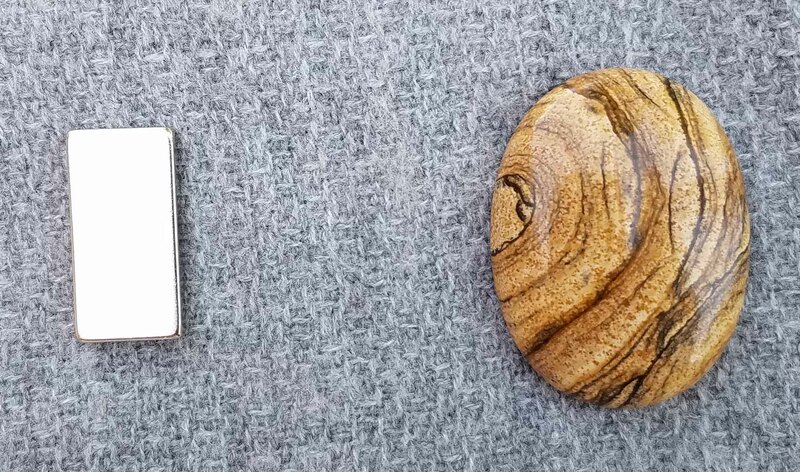 This was the closest I could lay the magnet backing to the stone before the magnets would pull together. I took this photo so you can see the 2 pieces from the side of the back. They fit very snugly together. I had to stop and visit the lovely Christine at Holy Sheep Balls because the name was so great. 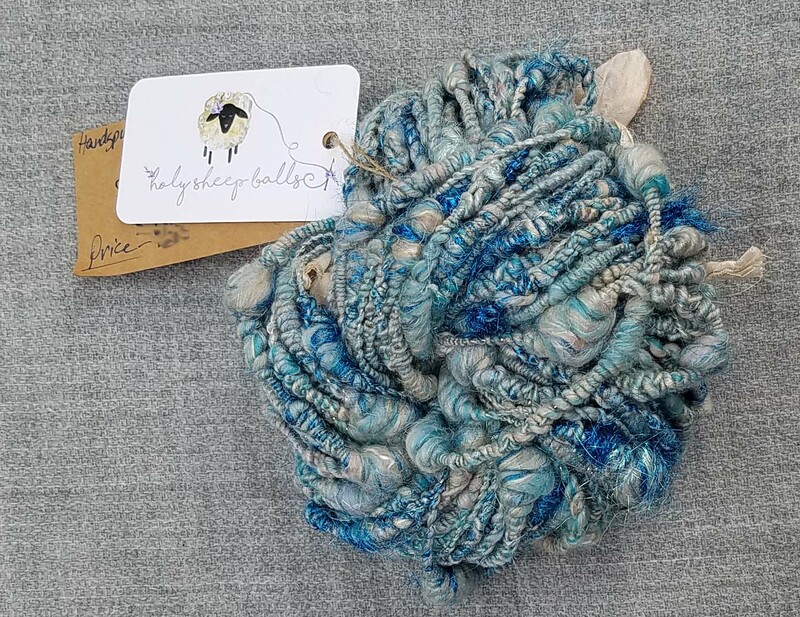 She had some gorgeous “art yarn”. I couldn’t resist this Blue sparkly one. 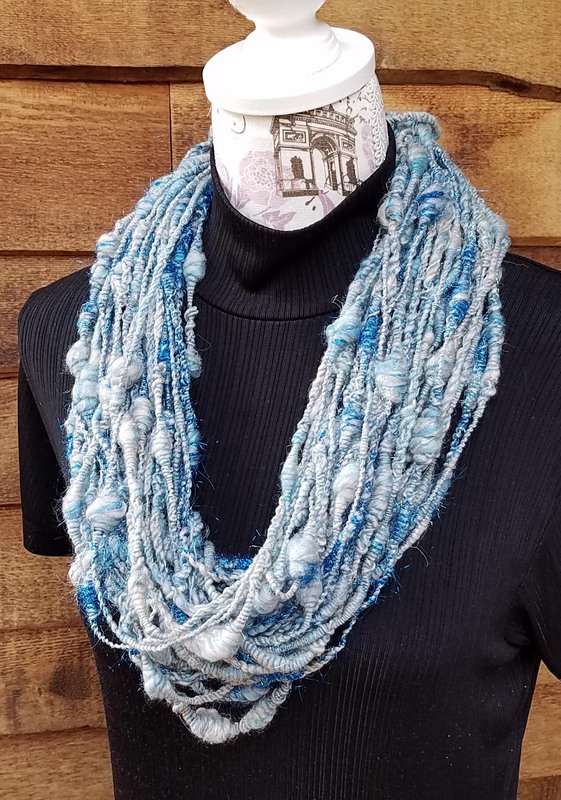 I doubt I will make anything with it, I’m just going to wear it this winter as a “necklace” it will be cozy warm as well as decorative. I might very carefully do some knot work to hold it together as a kind of cowl shape. I took a little break from shopping and had lunch with local friend Sarah and our other friend Amy (who was not feeling photographic). You might remember both of them from my adventures in Cama (Washington State) back in 2010. We had a lovely visit and lunch. I spent a little more time doing Board work, then took a break for a little rest. Of course, I wasn’t finished shopping yet. I had to stop by and see my friend Elf at RedFish DyeWorks. She always has such amazing colors and yarns. 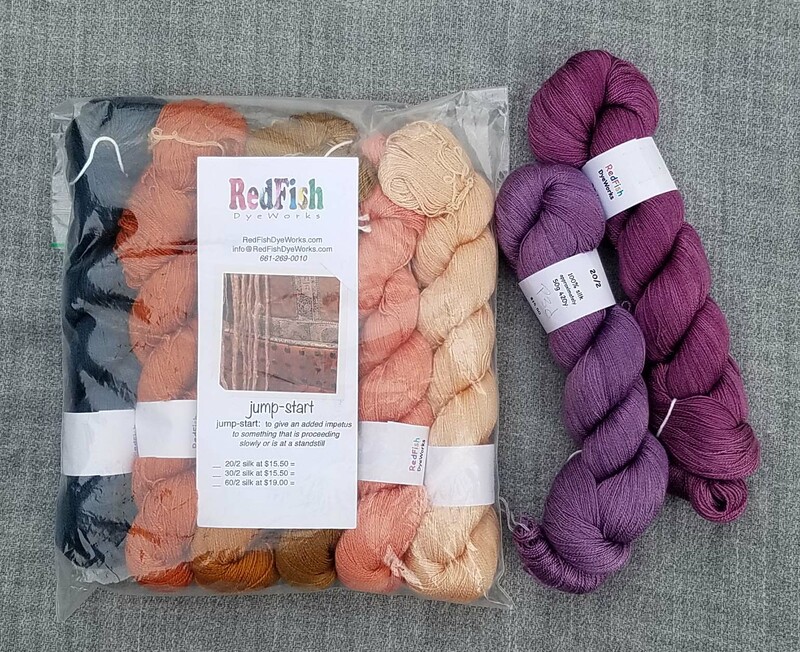 I couldn’t resist this “Starter Pack” dyed in colors picked from the photograph you see on front. I wanted to add a bit of purple to the palette too, but couldn’t decide on which one, so I got both. I have something very creative and exciting planned for this yarn. Friday evening was the Excellence in Crochet event, where the winners of the Design Competition would be announced. There was quite a line waiting to get in because everyone wanted to get a Goody Bag. I got to spend some time with some of my favorite folks while we waited. 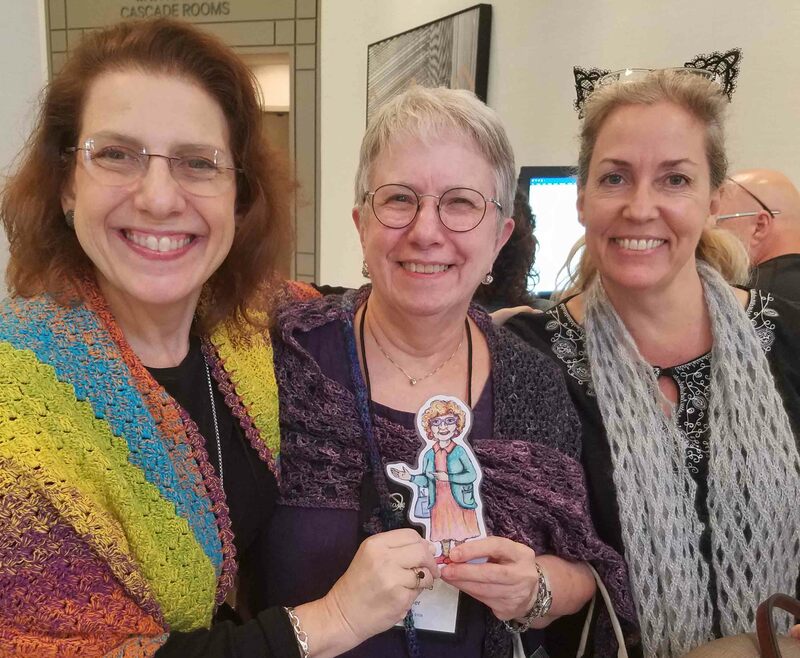 That is Shari White, Pam Shore and Vashti Braha hanging out with Florence. 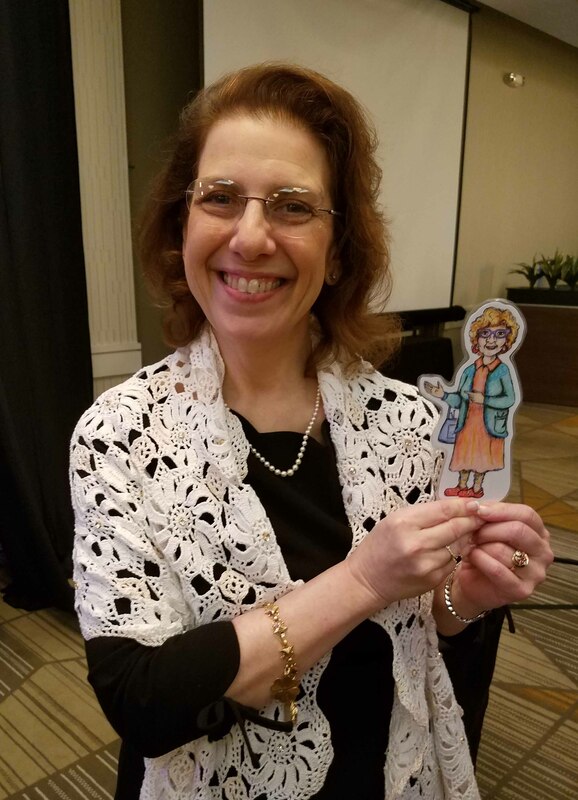 The Design Competition results were applauded and we had a wonderful presentation from Suzann Thompson about her crochet art exhibit. 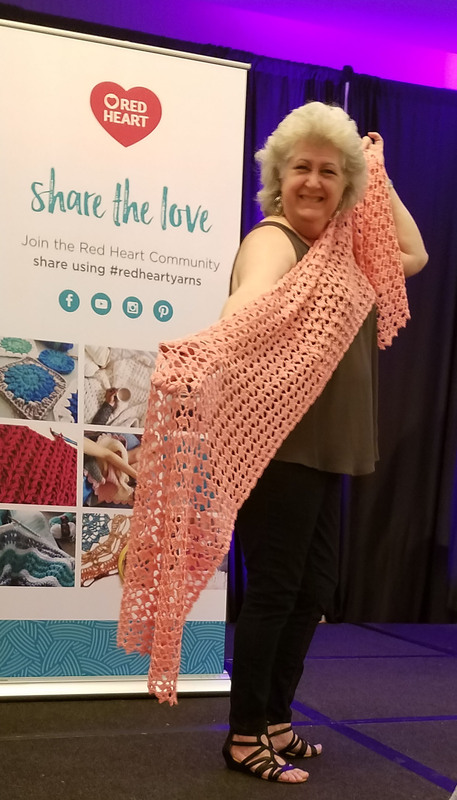 It wasn’t just about the exhibit, it was also about how to put something like that together and getting the community involved and excited about crochet. Very inspiring. The Goody Bag was full of all kinds of fun stuff. Lots of yarn, both full size and sample sizes. Some wonderful pattern books and magazines also. The bag was from “Simply Crochet” magazine and it says, “Eat Sleep Hook Repeat”. They know us crochet folks well. Saturday morning I was helping out at the CGOA Booth. We had a ball-winding station, were selling tickets to win a number of prizes and a “Selfie” frame that we helped attendees take their photos at. We were also answering questions about CGOA and encouraging non-members to sign-up. I got to work my shift with Bobby, who was having a great time with Florence. He was the champion ticket seller for the drawings. My good friend Kathy White came by and we had our photo taken using the selfie frame. After I was finished at the booth the rest of Saturday zipped by. I helped my Fashion Show Chair, Pia, with a couple of prep tasks for the Fashion Show. 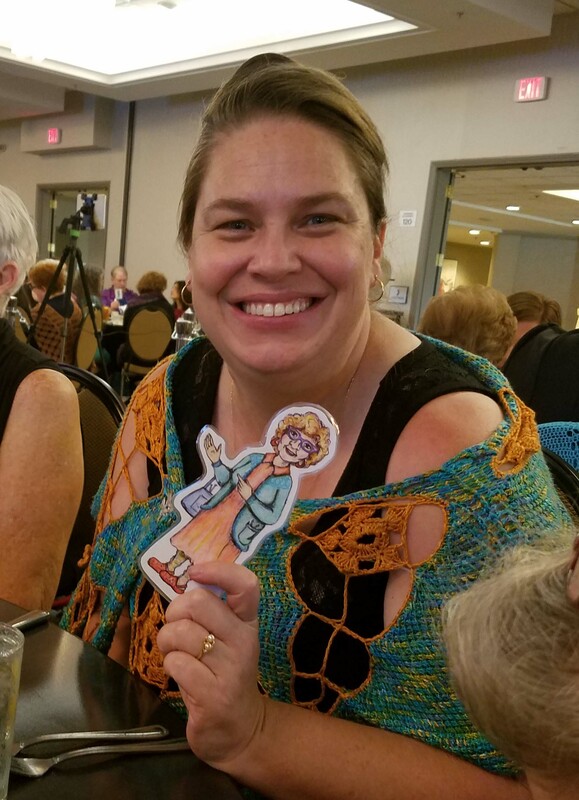 Then ran around stopping to visit with various friends and making new crochet friends before it was time to get dressed up for the Banquet evening. Kathy had to have a cuddle with Florence again. The Banquet is the last event of the show and it is always when we are all trying to get photos of and with everyone before we all have to say good-bye. They gathered everyone in the hotel lobby and took a large group photo. I got a few photos with friends afterward while we waited to go into the banquet. Bonnie Metzer with Florence, getting Bonnie to hold still for very long is nearly impossible, so this photo is a bit blurry. Some wonderful friends from the FreeForm group, Barbara Hynes and Mirto. Don’t you love their dresses? They both modeled in the Fashion Show. 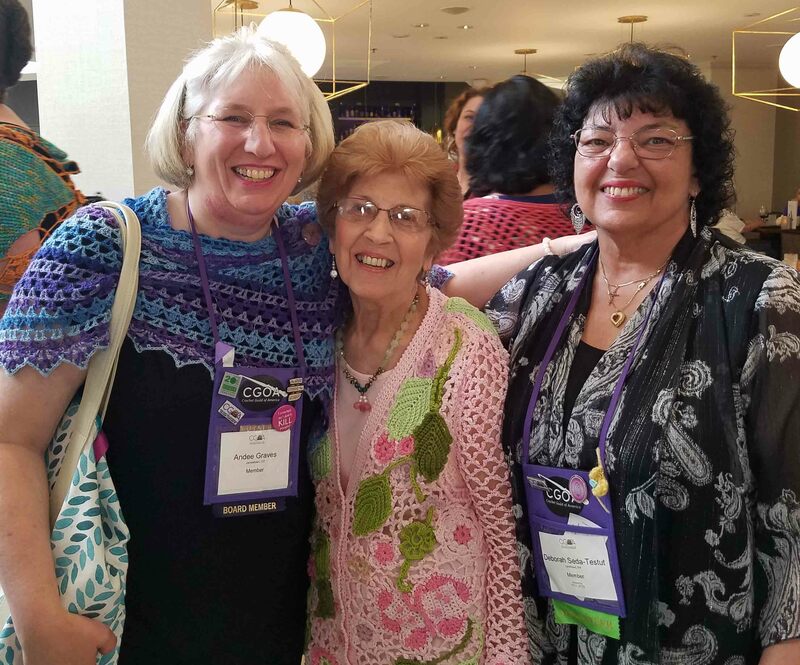 Margaret Hubert wanted a photo with me and Deb Seda, so I handed off my phone for this one. Love this shot with us all laughing. Margaret was wearing her beautiful new sweater. Linda Dean and I were sitting at the same table during dinner. We actually behaved ourselves well. 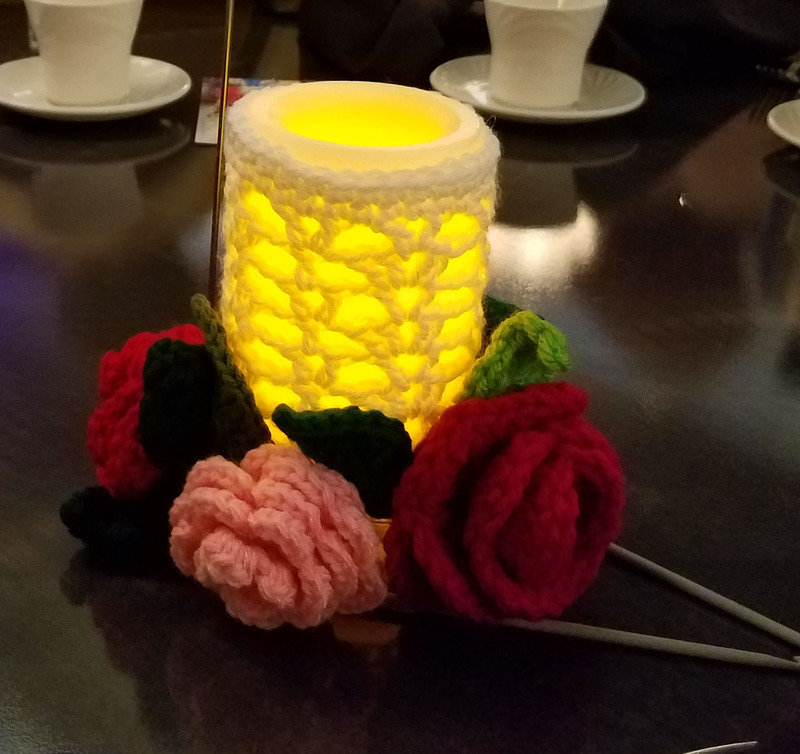 All the tables were decorated with crocheted roses around a candle. During the Fashion Show, Nancy Smith modeled my Shining Day Wrap. It got a bit comical because she kept getting tangled in the lace. We were all a bit tired after the banquet, but I got some last photos. Here is Carolyn, Susan and Shari. 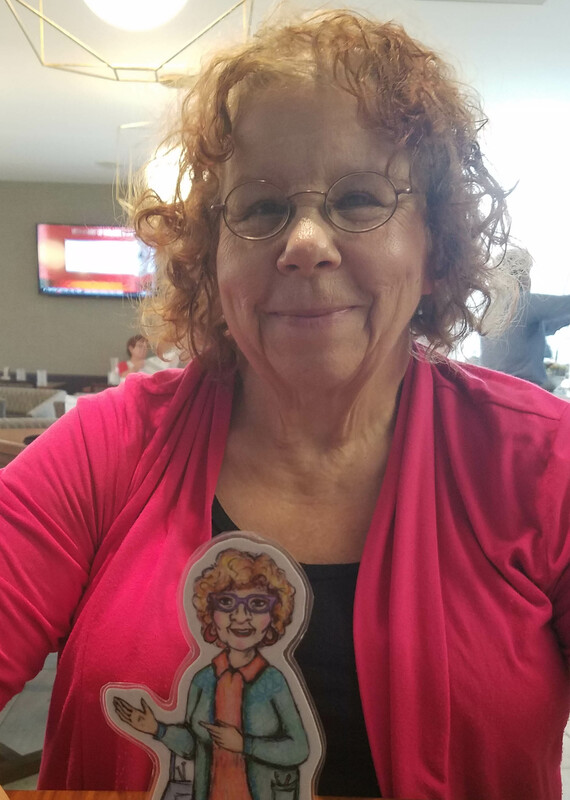 Shari was having fun with Florence. She said Florence needed to be in the poster for the evening’s Sponsor. 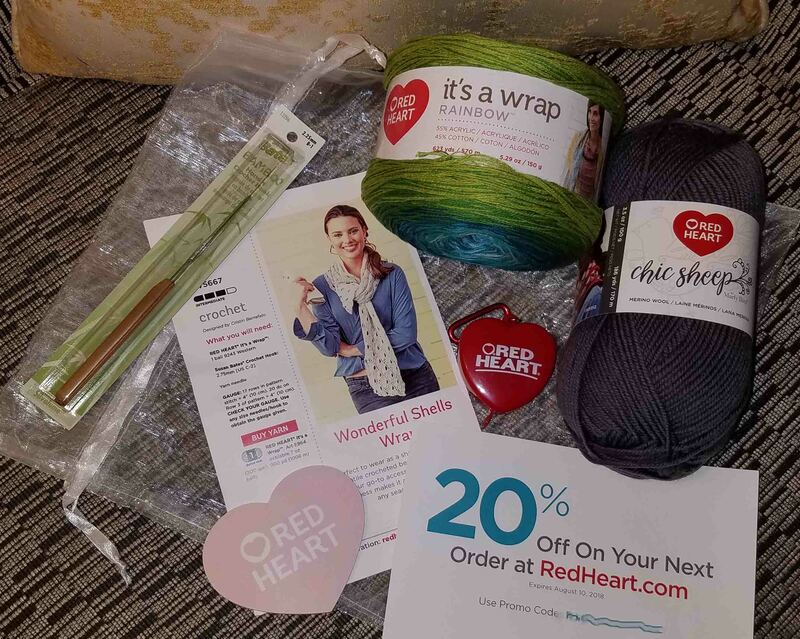 We got lovely good bags from Red Heart on our chairs. 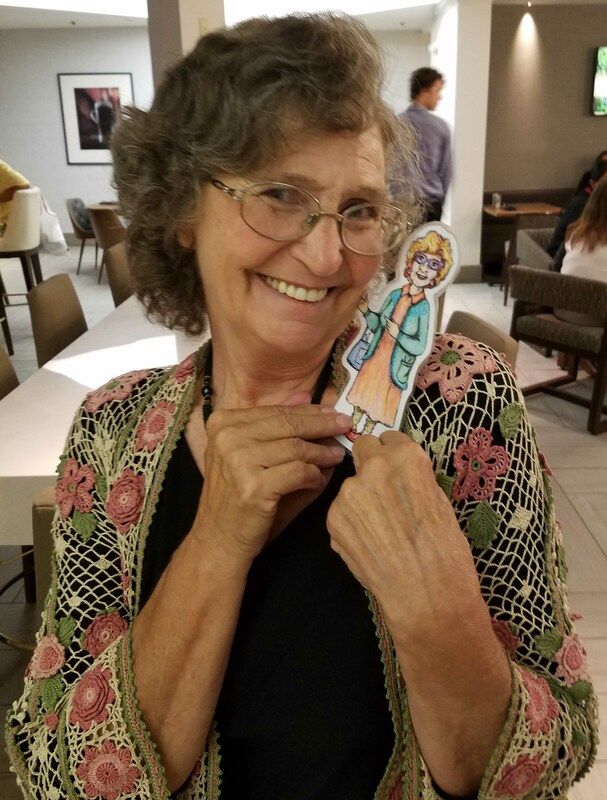 Yvette and I had been having all sorts of fun thru-out the show, so we needed a photo of her with Florence. She was calling us “pocket book twins” because we were both carrying Vera Bradley bags of the same fabric. Behind Yvette you can see Pauline Turner. She was the recipient of the Hall of Fame award and gave a lovely speech and presentation before the Fashion Show. 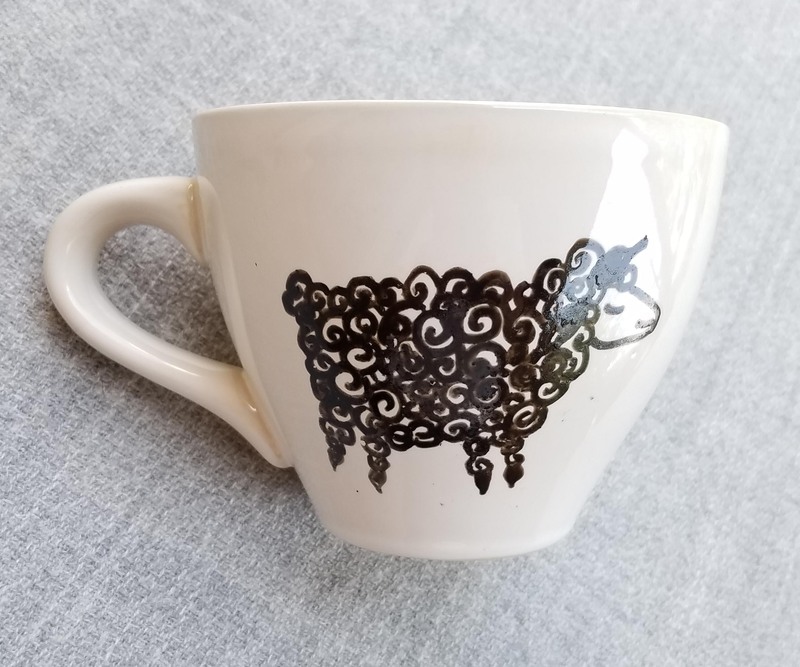 My friend Pam surprised me with this lovely mug from Renegade Yarns. She says this is my new phrase, hmmmm is she trying to reform me? I had looked at the mugs they had and meant to go back to get one but forgot. So this was a great surprise. 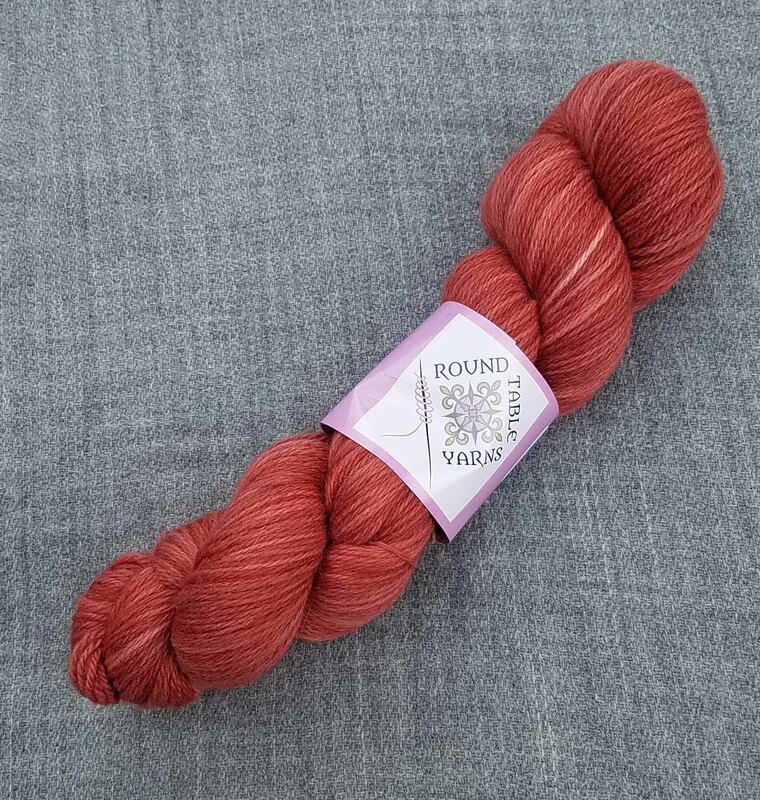 Pam also gifted me some yarn she won. She didn’t think the color worked well for her and knows I love corals and reds. A Portland show isn’t complete without a photo of the lovely Bonnie Pierce and her husband Bill. We didn’t get to spend nearly enough time together but it was lovely to see them both. I hope I’ve inspired you to join us at a conference soon. 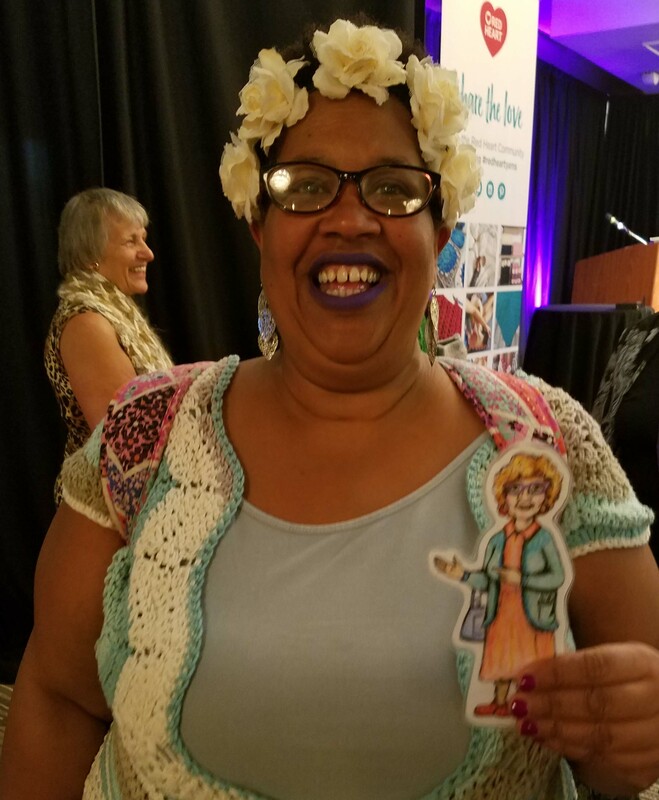 The best part of the conference is seeing crochet friends and making more. Plus there are wonderful classes to take. 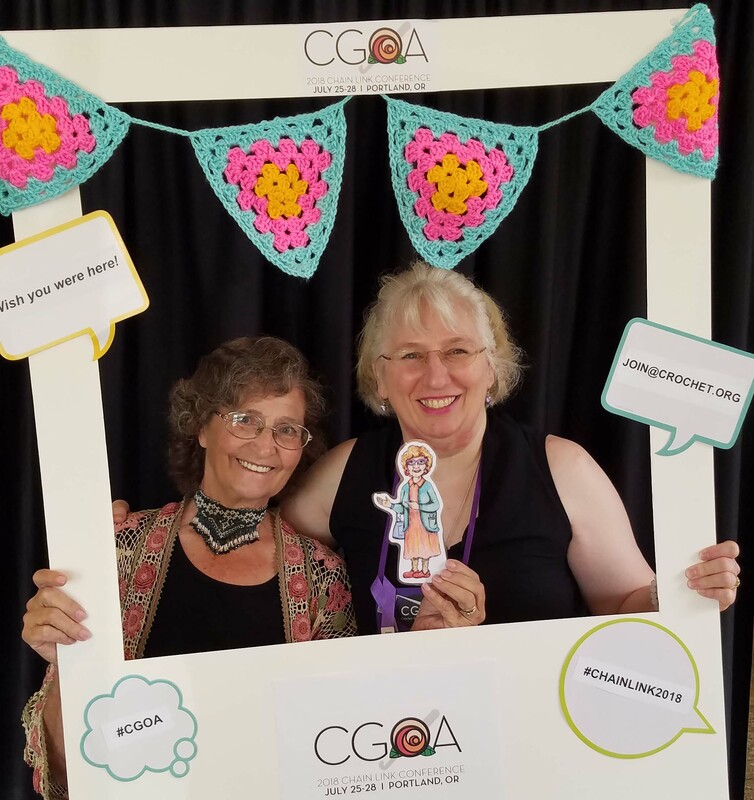 Check out the CGOA website at crochet.org for more information about upcoming conferences. Thank you for the wonderful report. I was so sorry I couldn’t make it but it’s lovely to see so many of my friends in your photos. Maybe next year…. I really hope you can make it next year. Will be a bit further to travel for you since we will be in Manchester, but you will be welcomed with open arms.